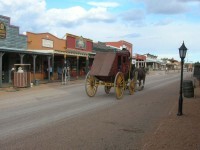 Tombstone is probably the most famous town in the Wild West, and attracts thousands of tourists with its old wooden, Western-style buildings, swinging saloon doors, stagecoach rides, gunslingers, dusty streets and shootout re-enactments. Many Hollywood movies have been shot here against the rugged mountain backdrop. Originally a silver boomtown in 1877, it rose to notoriety in 1881, when lawmen Wyatt Earp, his two brothers, and Doc Holliday confronted a band of outlaws and a gunfight ensued. This event has come to epitomise the spirit of the Wild West and the star attraction of the town is the OK Corral, one of southern Arizona's most visited tourist sites. There is a staged 30-second shootout each day at 2pm, and exhibits relating to the event inside the corral. The Tombstone Courthouse State Historic Park features an old courtroom where several renowned trials took place, as well as some excellent exhibits, including alternative versions of the OK Corral shootout and a museum dedicated to the Tombstone Epitaph, the oldest newspaper in Arizona. Although a classic tourist-trap town, with souvenir shops and restaurants galore, many people love the Wild West atmosphere and the rugged setting of Tombstone, and relish the chance to play cowboy for a day.